How to Fit Snowboard Bindings? How to Position Snowboard Bindings? Even if the bindings aren’t the most exciting thing to shop for, we’re sure you agree that they’re kind of important (almost as much as a proper snowboarding helmet!) Without good bindings you won’t be able to truly enjoy ski and snowboarding, and it will be hard to improve. We figured that it would be good to have a little guide, perhaps, I don’t know, ten different bindings that are great and some information about them and then some answers to questions you might have. If only there was such a guide… Oh well, there is now! We’ve selected ten great snowboard bindings that you can’t go wrong with (as long as you pick the right snowboard boot sizes). We’ve looked at many different bindings and read lots of reviews to make sure that we only include the best ones. In addition to this we have also watched a bunch of video reviews which we will link to so that you can watch them too! Let’s take a look at the different snowboard bindings! Have a quick look through them and select a few that you want to know more about and compare them to each other. Make sure that you watch the video reviews too! Make sure you keep your snowboard gliding with one of these top rated snowboard waxes. The first snowboard bindings are Burton Malavita snowboard bindings, and they are super comfortable! They are somewhere between medium flexing and stiff flexing on the flex rating, but they will still give you a soft feeling because of the soft material underfoot. They’re made for a long day out and will help you to ride the whole day without getting tired. Another good thing about the soft material underneath the burton binding is that it makes the bindings lighter than if you would have the same material throughout the whole thing. This is perfect since you really want your binding to be as light as possible, but it’s a tricky balance because at the same time they need to be stable and dependable. The burton Malavita snowboard bindings definitely have both, which is great! You will feel your ollies become more effortless and the bindings really make your ride as smooth as possible, they enable you to ride just the way you plan to and get the right stiff or soft flex on the flex rating chart. They’re not just a pleasure to use, but also look really good, they’re very professional-looking! 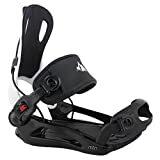 These snowboard bindings are best suited for intermediate to advanced level riders that need to have a binding that can keep up and enable them to do pretty much anything they set their mind to. The Malavita’s are available in Black, Black Fade, Black/White, Hemp, Turquoise and White. Why We Liked It – There are a few things about these bindings that make them stand out from the rest. One thing is how they look, which might not be super important, but it’s always nice to have equipment that looks good. All the colors are really nice, and you can be sure to find one that works with the rest of your snowboard gear. We especially like the turquoise color! The best thing about them, however, is something you won’t notice at first glance; how comfortable they are! The cushioning underfoot is a great feature and is not just good for comfort, but it makes them lighter than many other bindings as well. As an alternative, try the burton stiletto, burton lexa or burton missions. All in all really good bindings that you just can’t go wrong with! Next up on our list is a very similar pair of bindings from the same brand. They are also good snowboard bindings, but slightly cheaper. You might wonder why though, when then look almost exactly the same. Well, there are a few things that are different, for example what’s going on under your foot. While the Malavita’s have soft cushioning, burtons cartel snowboard bindings have a gel that not only is really comfortable, but also dampens impact, which is good for your knees and joints and, of course, your feet. This does make them a little bit heavier than the others, but which is best is up to you, it’s just a matter of taste really. Both bindings have a really good hammock ankle strap that makes them easy to get in and out of and makes your feet stay put. The highback really offers a lot of flexibility and can be adjusted to fit perfectly. These bindings will put your foot in the ultimate position and angle for a smooth ride! Here is a video review, complete with snow and all! 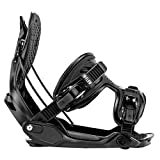 Burtons Cartel snowboard bindings are also best for intermediate or advanced riders, because they are so responsive. A beginner might struggle a bit with them, and would be better off with something less responsive. There are quite a few different colors available, choose from Dusty Gold, Tommy Bananas (yes, they have bananas on them! ), Blue Boy, Black Matte and Primed, which is a light grey color. We are clueless as to why anyone would ever buy black or grey bindings when there are bindings with bananas available, but it seems like people actually do. It’s of course their personal choice, but come on, bananas are awesome! + Nice colors, including Tommy Bananas! Why We Liked It – There are a couple of possible reasons why you would buy burtons cartel snowboard bindings instead of number one on our list. Firstly they are a little bit cheaper. Secondly, they might come in a color you like better, such as Dusty Gold or Tommy Bananas. It might even be that you think they are more comfortable! Whatever reason you buy them for we’re pretty sure you will be happy with them, they’re really good, so anything that is better will only be slightly better and you will probably not feel a huge difference. It’s time to move on from Burton snowboard bindings and take a look at something else. What’s that? You want to see a budget option? You’ve got it! These flow snowboard bindings from System are rear entry bindings, which means that instead of putting them on by sticking your foot in from the top, like putting on a shoe, they open up in the back so that you can just stick your foot in there! It’s really easy to get in and out of these. There is plenty of space for your foot when you get into them, so that you don’t get stuck. It’s a very smooth and quick process that is easy to do when standing, so you never have to sit down to put them on. These bindings cost about a third of what the others we’ve looked at does, but they’re still a really good option, especially if you want rear entry bindings. They’re comfortable with full EVA padding on the highback and the footbed has high density dampening to make them as ergonomic as possible. These flow bindings are great for beginners, since they’re so easy to get in and out of. They’re also really cheap, which is a good thing, because as a beginner you often don’t want to spend too much money on every single item you need to start ski and snowboarding. It’s better to start with something cheap and upgrade when you have gotten better and know what you prefer in your equipment. It’s also good to wait with investing in expensive equipment until you know that you will continue ski and snowboarding in your own riding style, and it wasn’t just something you were into one season and never got back to. There is nothing as annoying as expensive stuff you used once gathering dust in the attic! They are only available in black with some white details, which is quite boring, to be frank. But on the other hand, black and white goes with everything, so you can use these no matter what your other equipment looks like! Why We Liked It – So why would you pick these snowboard bindings over all the others on the market? One good reason is the low price, they are very affordable but still good. The other thing that makes them special is the rear entry, which makes them easy to get in and out of, even when standing up. We’re excited to have found such a good budget option! Try the flow omni, flow alpha or flow nx2 as awesome alternatives. Next up are the K2 Hurrithane snowboard bindings from K2. They’re lightweight and very flexible, the highback is really soft and you will feel like it’s just you and your board, you won’t have to think about the bindings at all, they give you a very natural feeling. The ankle strap can be re-centered if needed and the toe straps can be worn either in front of your toes or at the top of your foot. So now we know a little bit about the K2 Hurrithane, but what kind of customers should consider buying them? The Hurrithane snowboard bindings are best for experienced snowboarders that know what they are doing. They are very flexible and while that is a good thing for a good rider, it can actually make it more difficult for beginners that don’t have 100% control over their board yet. They are very durable, so no matter how much you will use them, you can be sure they meet your requirements! There are a few different colors to choose from. There is Ale, which is a yellowish beer color (sounds weird but it’s cool!). There is also Surf, which is light blue, red and black with yellow details. The colors are very different, which increases the chances of finding one that goes with the rest of your stuff. “You’re a good snowboarder that loves to try new things and likes adventure. You’re a go-getter and have no problem making decisions, which affects the way you ride, you like to be in control and don’t have any time for heavy snowboard bindings weighing you down. Appearance is important to you and you would only wear and use equipment that looks nice.” Try the K2 lien FS as an alternative. Wow, the Hurrithanes seem to ask a lot of you, but you can be sure that they will give you a lot back as well! What if you feel kind of confused by all the different kinds of snowboard bindings out there? Maybe you just want to find something that is a good all-round product, that most likely will do the job the way you want it to be done without all the extra fuss? Then these Flux DS snowboarding bindings are probably perfect for you! They are good for all kinds of snowboarding and can be adjusted to work for anything. It’s also cool that they are tool-less! These flux bindings are very versatile and can work for any snowboarder, from beginner snowboarders to more advanced riders. They are pretty expensive however, so if you’re just starting out snowboarding you might want to try something cheaper first so that you don’t spend lots of money on equipment you potentially could stop using. How about a lush Pearl Black or a natural Woody Green? If those colors don’t suit you there is always the red or white alternatives! Why We Liked It – So, you might be curious, what is it that makes these flux bindings better than all the rest? The simple answer is: nothing. They’re good, there’s no doubt about that, but they don’t offer anything special that no other bindings can’t give you. But sometimes it’s nice to go for a dependable product from a good brand that you know will do what it says on the box! Imagine a snowboard binding that looks like the guy who designed the army’s uniforms has designed it. Now mix that up with those ugly sandals your dad always insists on wearing with his socks still on. Can you see it? That’s the Flow Nexus Hybrid snowboard bindings! They’re not pretty, in fact, they’re really ugly, but we forgive them! They’re pretty cool, because you can choose to either use them as side entry bindings, or you can fold back the reclining highback and stick your foot in that way! These flux bindings also come with a 1-year guarantee, which is nice. Here is a video review where you can learn even more about these bindings! These flux bindings work well for any snowboarder, no matter if you’re a beginner or more advanced. The colors available are Black, Green and Stormtrooper. We never knew Stormtrooper was a color, but we’re sure you can guess what it looks like! Why We Liked It – It only takes a quick look to notice that these snowboard bindings aren’t like all the rest. This type of binding is something unique and it’s cool that you can enter through the side or fold back the reclining highback. They feel really dependable and they probably are, since they come with a 1-year guarantee. Next up is a snowboard binding specifically designed for women, K2’s Charm. They are very similar to the Hurrithanes we have as number four on our list, so you can pretty much read that review but pretend it’s the Charms instead! All snowboarding women can use these snowboard bindings, regardless of how experienced snowboarders they are. The Charms come in purple, white and black. Why We Liked It – As they name suggests, these womens snowboarding bindings are really charming! They are comfortable, light and look nice. If your feet are still growing you will be able to extend them so that you don’t have to buy new ones. Do you like Star Wars? Good, we thought you might. That’s why we’ve included the Flite LTD Stormtrooper snowboard bindings from Flow! These are really nice and comfortable type of bindings that work no matter what type of snowboarding you’re into and that will keep your feet warm. ‘Wait a minute’, you might think. ‘I wear snowboard boots to keep my feet warm, not snowboard bindings!’. If you want to know how your bindings affect the temperature of your feet, stay with us and we’ll explain it in the Buyer’s Guide! These type of bindings work for any snowboarder, really. Black and white- you will have the feet of a Stormtrooper! Why We Liked It – What makes these bindings stand out from the rest is the design. Partly that they look like a Stormtrooper decided to start making snowboard bindings to match the rest of his outfit, and the design of the snowboard binding makes sure you won’t get cold feet… Literally! Most of the bindings we’ve looked at are best suited for experienced snowboarders, but what about beginner snowboarders? Surely there must be men and womens snowboarding bindings for them as well? Of course! Just look at Solomon’s Rhythm binding! They’re easy to get in and out of, very durable and extremely comfortable with lots of nice padding under your foot that will make every ride as smooth as possible and will save your knees and joints as well as your feet. Another good thing about the Rhythms is that there is both a model for men and one for women. These allmountain bindings are best suited for beginners and intermediate riders. They are both women and mens snowboard bindings. The colors depend on if you buy the men’s or women’s model. You can choose between pink, army, black, white, azure and red. Why We Liked It – These women and mens snowboard bindings are great for beginners and come in really nice colors. The padding under your feet will make the ride extremely comfortable! They are also suitable for both men and womens snowboards. Let’s finish off this list with a really good budget option! Burton bindings are a great way to save some money but at the same time getting as good allmountain bindings as possible. They are light-weight and comfortable with good padding, and you can choose to tilt the highback as much or as little as you like. Snowboarders who want to spend as little as possible but still get good all mountain bindings. One example is beginner snowboarders who might not even be sure how long they will continue with their newfound hobby, and just want to find something that works well without costing too much. The Custom burton bindings come in red, black and light blue. Why We Liked It – The one thing that makes them stand out from the rest of the bindings is the price and the extremely good value for money. You will get bindings that are high-quality but at the same time not breaking the bank. These burton bindings are fantastic beginner bindings, at a brilliant price. Check out the burton Lexa as another option. Buying snowboard bindings can seem to be difficult, but it’s not that bad with the help of a buyers guide. The first thing you need to know is that just like shoes, there are different bindings for men and women. Just like clothing you can of course choose to ignore this, but men’s feet are most often bigger than womens snowboarding bindings, so it’s mostly just a matter of snowboard boot sizes. The second thing is that you want bindings that are comfortable, preferably padded, and light. You also need to look carefully so that the binding you buy is compatible with your snowboard. 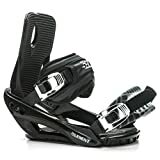 Another thing you need to decide is if you want bindings you put on by sliding your foot in just like a shoe or if you want rear-entry bindings, which are generally easier to put on while standing. Read through all of our reviews and think about what you need from your bindings and what color you would like. Then select three or four different bindings that you want to compare and look up the video reviews. If you’re still not sure what bindings you should go four, make a list of your own pros and cons and see if there is a clear winner. If you have no idea what bindings you should buy you might find it helpful to go to a shop where the staff are experts at snowboards and get some help from a professional. Once you have bought your snowboard bindings you might wonder how to actually attach them to your snowboard, or get your snowboard boot fit correct. It’s kind of hard to explain without being able to show it, so we suggest you watch this video to see how it’s done! If you watched the video about how to mount your snowboard bindings and you still feel like you need some information about how to position the bindings correctly we would recommend this video, which is really good! There are many different snowboard bindings to choose from, and at first glance they might seem to be exactly the same, but a quick look at ten of the top snowboard bindings has shown us that it’s always worth doing your research! We’re hoping that you feel better equipped to pick out your new snowboard bindings! What kind of snowboard bindings you have can actually help your feet to stay warm. Look for bindings that distribute the weight evenly over your foot, so that the blood circulation doesn’t get cut off anywhere. This will make it easier to keep your feet warm. The more advanced you are, the more softer flexes your snowboard bindings need to have.